Recently I attended a PeerSpirit writer’s retreat at Alder Marsh on Whidbey Island off of the Seattle Coast where I spent a week in a cabin cushioned by soft air among Douglas firs and alders. Communal gatherings were at the Marsh House, a low round building in a grassy clearing on the far side of the marshland. Several times each day and evening we’d travel through the watery marsh, sometimes singly and other times in quietly conversing pairs. In the morning weak sunlight struggling through grey clouds and full conifers revealed the way. 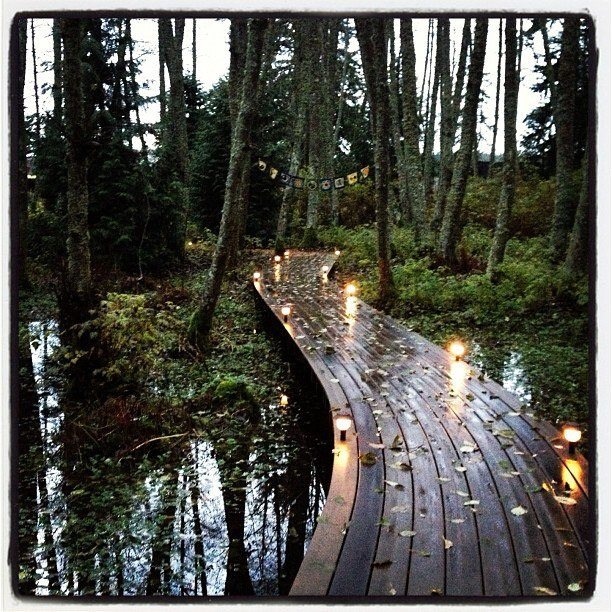 In the evening fairy lights defined the boardwalk at the turns over black water. The Alder Marsh was an obstacle. If we tried to walk through it we would have been soaked through by icy water, pushing past floating leaves, tripping over submerged stumps, stirring up the decaying vegetation and sucking mud. Instead, we walked above it. We were careful–the wooden path was wet with moss and mist. We were observant, seeing the floating leaves, sticks covered with lichen, majestic alders and logs furred by emerald moss. Everyday in our work we encounter obstacles. Some obstacles are deliberately dropped in front of us; others, intrinsic to the landscape. It’s much tougher if we force our way through. Rather, we can acknowledge what is in our way and walk above it, ending up where we need to be. Bridget McDermott Flood is the executive director of the Incarnate Word Foundation, a ministry of the Sisters of Charity of the Incarnate Word, San Antonio. Bridget has worked with the Sisters for more than fifteen years carrying out their mission to empower women, nurture children and address the needs of low income communities. At the Foundation, Bridget has collaborated on work in urban neighborhoods, education, women's micro-lending, and human trafficking. Bridget has served on numerous boards and task forces, including the White House Task Force to Reform the Neighborhood- and Faith-Based Office. Bridget is a potter who operates Carondelet Pottery Studio and is also a beekeeper. Bridget is currently writing Blue Hole Wisdom, a compilation of the wisdom of the Incarnate Word Sisters. She lives in St. Louis with her husband, Michael. They have two daughters, Amelia and Carolyn. See you at the Park.